St Mary the Virgin and All Souls Church. 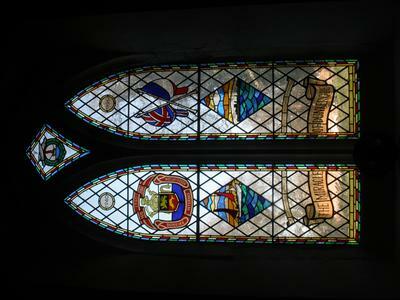 A stained glass window of two lights . The left depicts the coat of arms of the Dunkirk Veterans Association and a small sailing boat, and on the right a crossed Union Jack and French Tricolour with a naval ship below. At the top is a quatrefoil depicting a laurel wreath encircling a ship and crossed daggers above.